We are working hard to keep this highly challenging and rewarding experience alive, after the second very succesful UNESCO South East Europe workshop held in Podgorica, Montenegro, in September 2014. I want to thank the many great people that worked with me to make this esperience unforgettable, starting from Mario Scalet and Rosanna Santesso from the UNESCO Venice Office to the talented and skilled colleagues who shared their knowledge and vision with me and with the attending fellows. 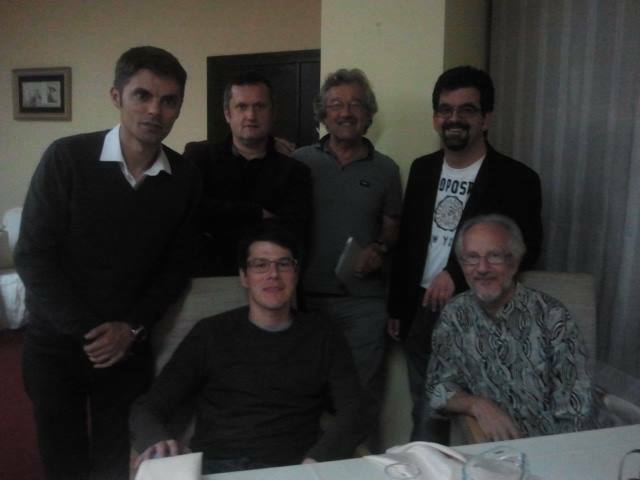 In the picture, some of the trainers of the Podgorica workshop. From left, standing: Slobodan Bubnjević (Serbia), Peter Mayr (Austria), Joost van Kasteren (The Netherlands), Fabio Turone (Italy); from left, sitting : Mićo Tatalović (Croatia/UK), David Ropeik (United States). Other colleagues who contributed to the workshops (the first one was held in Belgrade in 2013) and also deserve a huge THANKS are: Connie StLouis (UK), Claudia Di Giorgio (Italy), Hristio Boytchev (Germany), Bora Zivkovic (Serbia, US), Eshan Masood (UK) and of course Daniela Ovadia (Italy). P.S. Here is the segment broadcast by the Montenegrin State TV, with the interviews to several trainers (including Fabio Turone).